The Church Established, 303 - 400 A.D. While the persecution was being carried out in the East where the numbers of Christians were much greater, the Western Christians experienced very little pressure. Under Constantius (the father of Constantine) some church buildings were destroyed in Britain, Gaul, and Spain - that was the extent of persecution - there is no evidence that any Christian was executed. In addition to this lack of brutality, Constantine's half sister was named Anastasia (anastasis - Greek for "resurrection"). This indicates a Christian influence in the household of Constantius. Through a series of battles (commanders attacking each other, one Caesar attempting to knock the other off to take command) and alliances - Constantine is coming close to ruling the West and forms an alliance with Licinius (in the East). In 312 Constantine engaged Maxentius (son of Maximian) for sole rulership in the West at the famous "Battle of the Milvian Bridge." According to Lactantius (4th century Church historian and father), Constantine had a vision of a cross in the sky and heard a voice saying something like, "Go, and in this symbol, conquer." In the battle Maxentius drowns in the Tiber river attempting to retreat. Though the details are sketchy and not easy to fully reconcile, it appears that Constantine knew enough of Christianity to believe that his vision was of the God of the Christians, that he was chosen (or destined) by this God to rule the empire, and it was the beginning of his embrace of Christian faith. We will discuss the faith of Constantine in more detail later. This battle leaves Constantine as the sole leader of the empire in the West. This treaty marks an historic moment for the Christian faith. It is decreed that all Roman citizens would have religious freedom - the ability to worship however they wanted without interference from the empire. This did NOT represent Constantine making Christianity the official religion, but it does effectively put an end to the persecution of Christians. Constantine and Licinius also entered something of a truce, putting an end to the leadership strife that had existed for the previous 20-25 years. 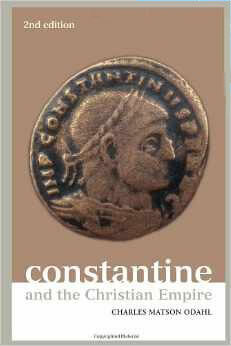 However, Licinius disagreed with Constantine's support of the Christian Church. He wanted to promote the Roman gods and the Christians were his biggest obstacle. While Licinius and Constantine had a military truce, there was something like a religious cold war waging: Licinius persecuting Christians while Constantine supported them. This truce lasted until 323 AD when the two Augusti met in battle - Constantine defeated Licinius in battle and became the sole ruler of the Roman empire. Numerous CH101 readers have written to me with questions and critical comments about what I have written regarding Emperor Constantine. There is a significant percentage of conservative Protestants who believe Christianity suffered greatly under Constantine. As a young man I was taught that the Catholic Church started with Constantine and was the beginning of Christianity losing its way. "Paul said that the 'mystery of iniquity' was already at work in the church even during his day (2 Thes. 2:7). How much more in the years following the death of Paul and the other Apostles would the 'mystery of iniquity' be working." 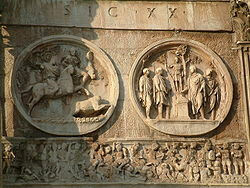 A contemporary image of the Battle of the Milvian Bridge from the Arch of Constantine in Rome.